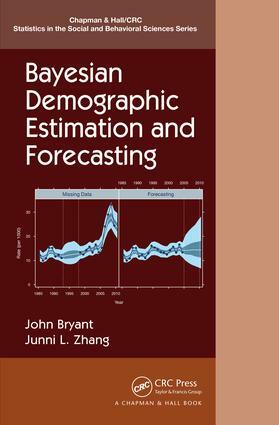 Bayesian Demographic Estimation and Forecasting presents three statistical frameworks for modern demographic estimation and forecasting. The frameworks draw on recent advances in statistical methodology to provide new tools for tackling challenges such as disaggregation, measurement error, missing data, and combining multiple data sources. The methods apply to single demographic series, or to entire demographic systems. The methods unify estimation and forecasting, and yield detailed measures of uncertainty. The book assumes minimal knowledge of statistics, and no previous knowledge of demography. The authors have developed a set of R packages implementing the methods. Data and code for all applications in the book are available on www.bdef-book.com. John Bryant is a senior researcher at Statistics New Zealand. He has previously worked at the New Zealand Treasury, and at universities in New Zealand and Thailand. He has consulted for many international organizations, including UNICEF, the FAO, and the World Bank. His research interests include applied demography, data science, and Bayesian statistics. Junni L. Zhang is an associate professor of statistics at Guanghua School of Management, Peking University. Her research interests include Bayesian statistics, text mining, and causal inference. She has extensive experience teaching undergraduate, graduate, MBA and executive courses, and is the author of Data Mining and Its Applications (in Chinese).